Hello! It's time for a brand new Mojo Monday sketch (#219). I hope you will join us this week! Debbie has created another great sketch for us to play with! I really don't need anymore Christmas cards for this year, but I can't seem to stop playing with Bright Spirits! So even if this doesn't get sent out this year, I can add to my stash for next year! Although there are a lot of layers on my card, I kept my embellishments to a minimum, just adding some black flatback pearls from Pizzazz Aplenty. Accessories: Standard and Scalloped Circle Nestabilities (Spellbinders), Black flatback pearls (Pizzazz Aplenty), Foam tape, Thread, Sewing machine. Great papers and use of the sketch. I'm pouting because there is a skewed panel LOL! Such a classy card. Love the stitching and black pearl accents! This is SO gorgeous Steph! LOVE the mix of papers on this! love all the layering and colors. this is such a beauty! Steph! Beautiful card Stephanie! 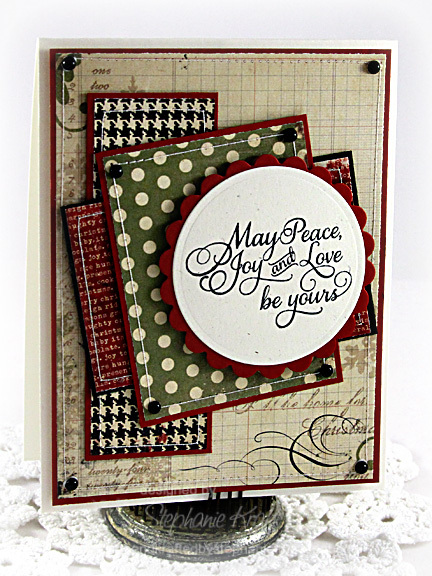 Love the wonderfully framed sentiment and your choice of patterned papers! Thanks for the inspiration! Truly a beautiful card, so pretty! Beautiful, Steph! Love your paper choices!! Love this card, so pretty.